Are you looking for something to do with the leftover Turkey from Thanksgiving and Christmas dinners? Don’t get rid of it, make this delicious Turkey Pot Pie. 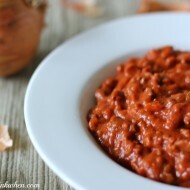 It’s one of my favorite leftover turkey recipes. BONUS: Grab this FREE printable shopping list/check list/menu planner for your best Thanksgiving ever! Thanksgiving is a great time to have family over. Catch up on what’s been happening throughout the year, give the cousins time to catch up, and watch some good football. Then there’s the HUGE turkey that everyone waits with anticipation for carving. 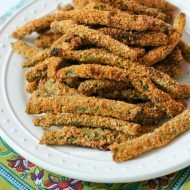 Holiday favorites like mashed potatoes, green bean casserole, and sweet potato casserole might be on the menu. It seems everyone is looking for recipes to use that leftover turkey. Keep this handy, because not only would it be good for any leftover Turkey meals, but it would be amazing with a Rotisserie chicken as well. 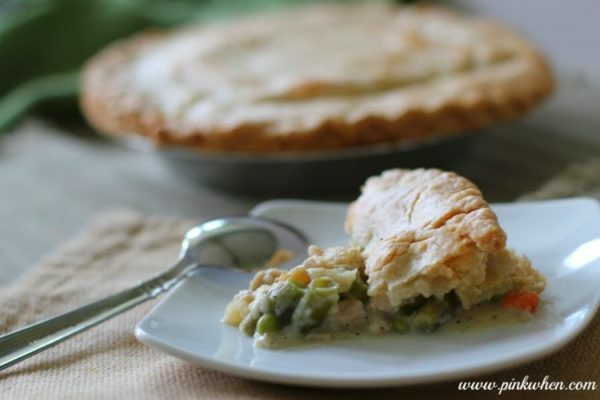 Try it in this Chicken Pot Pie Recipe. Step 1: Preheat oven to 425 degrees. Melt the butter and add the celery and onion to a medium pot and saute over medium heat for about 8 minutes. Step 2: Stir in 2/3 cup flour, salt and pepper, celery seed, onion powder, garlic powder, and Italian seasoning. Slowly whisk in the chicken broth and milk, stirring constantly until the the mixture begins to thicken and then simmer lightly until thickened. Remove from heat and mix with the drained vegetables and turkey. Step 3: Fill two pie crusts with your turkey and vegetable mixture. Carefully top each pie with another pie crust, pinching the sides together. Cut several small slits into the top of the pie crust to allow the pies to vent while cooking. Step 4: Bake uncovered in the preheated oven until the pies are golden brown, about 30 minutes. If the tops of the pies are browning too quickly, place a sheet of foil over the pie crusts and continue to bake. Cool for about 10 minutes before serving. 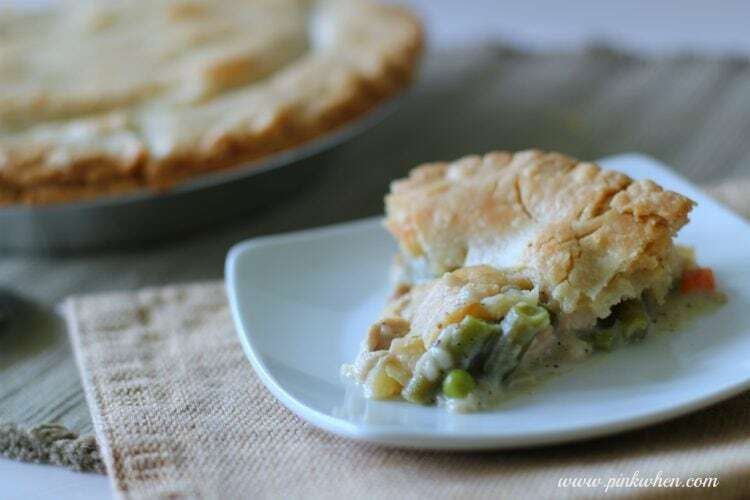 This has to be one of the most delicious pot pie recipes I have ever tasted! What a great way to use up that leftover turkey. Another great substitution for turkey would also be to use a Rotisserie chicken. MMmmmm. I will be trying that soon. 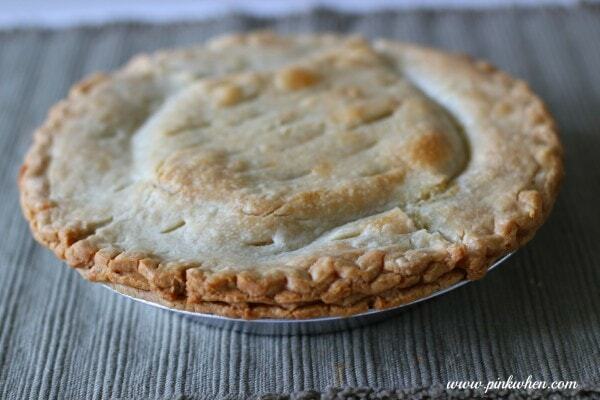 Have you ever tried a pot pie recipe? What about a Turkey Pot Pie Recipe? Make sure to save this one for those cold and snowy days ahead! If you liked this turkey pot pie, you’ll also like this Chicken Pot Pie Recipe. This recipe is adapted from the Dad’s Turkey Pot Pie found on AllRecipes, with just a couple of changes. I love turkey (or chicken) pot pie more than most meals, but I can’t see mine ever looking as good as yours. I’d have to keep out the onions in my family, but otherwise…swooon. I love c!assoc comfort food like this. Alright. This looks amazing. My husband brought home his first turkey last week and I couldn’t bring myself to eat it. BUT, maybe if it was hidden in a pot pie I could forget about the details?! Haha! 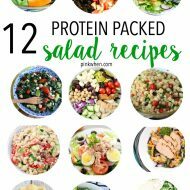 You – and he – would LOVE this recipe! You can also use a Rotisserie Chicken as well. It was SCRUMPTIOUS! Have you tried cooking and then freezing this? I’m trying to make lots of freezer meals before our baby arrives next month and just wondering if you know if it’s freezer friendly. Thanks! Looks great!!! My hubby and I just made this with our leftover turkey. Question – if we only want to cook one and freeze the other, is that possible (before it’s been cooked)? If so, how long do you cook it straight out of the freezer // and does it need to defrost first? I would probably freeze it before it has been cooked, then add on extra time to cook. (Like bake at 350 for 1 hour) You will probably have to cover the top with foil about 30 minutes into baking so that the top doesn’t get too brown. I’ve made this recipe twice now, including tonight and it is so very good. Most of the pot pie recipes I find online are obsessed with thyme and I just don’t think it belongs in there as a stand alone herb! Tonight, instead of using peas and green beans, I used some wild mushrooms I foraged today….this was the BEST pot pie I have ever made! Thank you so much! This looks delicious! I’m wondering if I could use half in a pie for now and freeze the rest for later? Maybe defrost and put in a pie crust when I’m ready for the second half?? ?